Starring: Joel Edgerton, Christopher Abbott, Carmen Ejogo, Riley Keough, Kelvin Harrison Jr. and more. A24 films have delivered quite a line of films within recent years. ‘Green Room’, ‘Swiss Army Man’, ‘The Witch’, and even recent Oscar Best Picture, ‘Moonlight’. They have delivered Indie spectacles and have been regarded as quite possibly some of the best films made, as of late. With this review, we have the most recent release from A24, the horror mystery film, ‘It Comes at Night’, starring Joel Edgerton. I personally have been excited about this film since I first heard about it, but who am I kidding? I get genuinely excited for almost every A24 film. It is officially time for ‘It Comes at Night’ to get Oberrated. Tension, mystery, slow-burn horror; this is not your typical horror movie. Arguments are flooding social media channels, face-to-face conversations are turning argumentative, and opinions run rampant for or against this film but at the end of the day, if you do not like slow-burning mystery horrors, you might as well wait for ‘Annabelle’ to be released in a couple of months. This is not your typical Hollywood Horror movie. If you want jump scares, an easy to follow plot, the typical 1, 2, 3, 4 sequence, etc, you will not enjoy this movie. This film requires some thought, it consists of human tension that is off the charts. It truly is a different breed of horror. Now for the true Oberrating; ‘It Comes at Night’ was quite the experience. While not my favorite A24 film, this studio is starting to become a second Marvel Studios to me. They continue to make films that are leagues better than the typical and they can only be ranked among each other; but when ranked to a standard Hollywood release, these films shatter them with no competition. Much like ‘The Witch’ and ‘Green Room’, ‘It Comes at Night’ drives suspense into its audience to the extreme. A mystery of “What could possibly happen next?” is the constant question throughout the film. While I consistently emphasize that this is a slow-burn horror film that acts as a psychological horror versus a fast-paced horror, let me say this word again, SLOW. If you do not have a taste in slow-moving films that focus on dialogue and environmental and mental horror elements versus the constant in-your-face jump scare horror elements, this will not be your movie. ‘It Comes at Night’ works its formula the way it should and fans of the slow-burn horror will come to enjoy this incredibly. One thing I specifically love about this film is the focus on the nature of humans when survival is the only thing that matters. The film is called ‘It Comes at Night’ but throughout the film, you are never told what specifically “it” is. This is an ‘open-to-interpretation’ type film. Some say it is the sickness, some say it is the dreams that are witnessed, some say it is trust. Regardless of the answer, the focus is on human nature and its survival instincts. Paul (Joel Edgerton) does everything possible to keep his family safe and alive and when they are faced with the choice of taking another family in for safe refuge, trust becomes the biggest element of focus. As I watched the film, trust was always an element of measure with every interaction I witnessed through the film between each character and if that trust was broken or even possibly close to being broken, the tension felt within the film sky rocketed. A24 continues to impress me each time with their films. As soon as one is even announced, whether I know its true intention or not, I want to see and (try to) understand it. I want to know the film’s purpose. ‘It Comes at Night’ puts on a high tensity slow-burning horror show that keeps you on the edge of your seat with every spoken word and/or action that is taken. It is a film that shows human nature’s most basic instinct; survival. However, here is yet another disclaimer; this is a slow-burn horror film. It is not ‘The Conjuring’, it is not a carbon copy of every Hollywood Horror film that spoon feeds jump scares like every PG-13 horror film does. It is a psychological slow-burn horror film. A24 delivers yet another Indie horror film that is a gem within the horror genre. 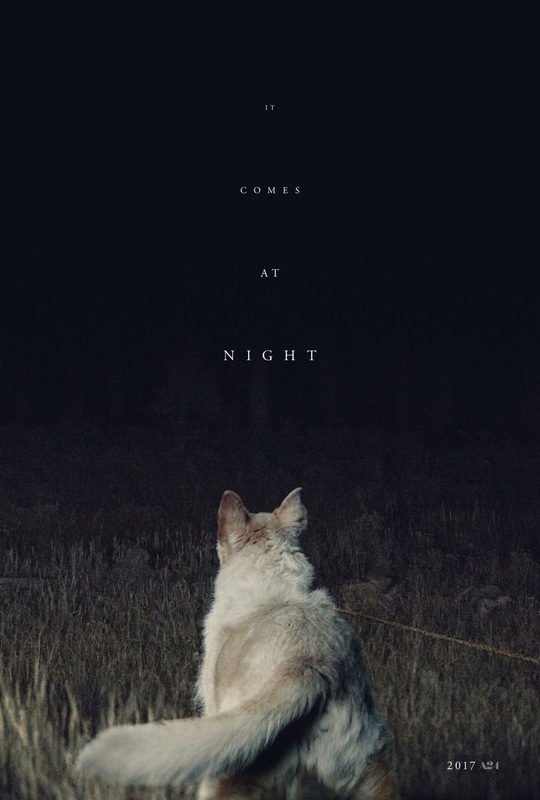 Posted in 2017 Movies, Movie Review.Tagged A24, Carmen Ejogo, Christopher Abbott, It Comes At Night, Joel Edgerton, Kelvin Harrison Jr., Riley Keough, Trey Edward Shults.